For many companies the appeal of the public cloud is very real. For tech startups, the cloud may be their only option, since many don’t have the capital or expertise to build and operate the IT systems their businesses need. 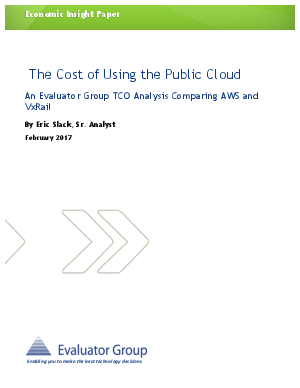 In this report we’ll explore that question, comparing the cost of an on-site hyperconverged solution with a comparable set up in the cloud. The on-site infrastructure is a Dell EMC VxRail™ hyperconverged appliance cluster powered by Intel® Xeon® processor and the cloud solution is Amazon Web Services (AWS).